Twenty-seven members of a spiritual organization called Sukyo Mahikari gathered on April 9 to take part in a wildfire readiness workshop put on by HWMO. 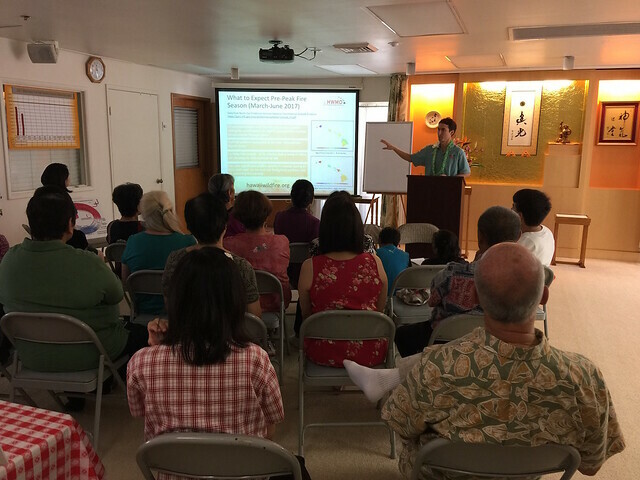 Held at the Sukyo Mahikari center based in Waikiki, Pablo Beimler, HWMO Community Outreach Coordinator and a member of the Sukyo Mahikari, felt at home as he shared about ReadySetGo!, Firewise Communities, and the upcoming Community Wildfire Preparedness Day events. Administrators from Sukyo Mahikari noted that it was the most well-attended emergency preparedness presentation they have had in recent years. Mahalo to Sukyo Mahikari for the opportunity and hospitality.